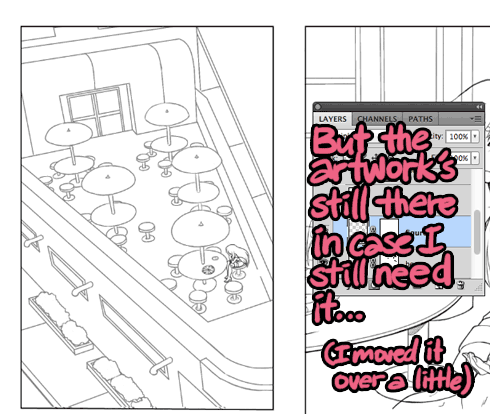 If I can help it, I never erase things in Photoshop. I opt for masks. 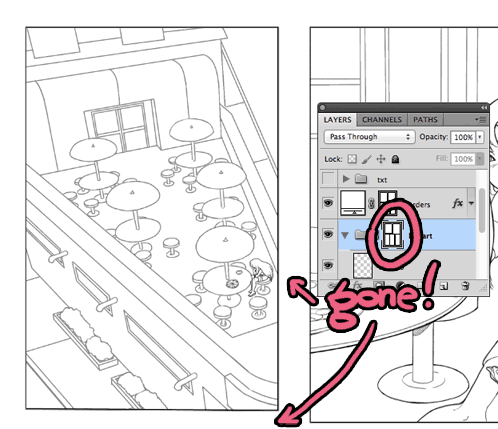 ↑ If you click on that button I highlighted, on any non-background layer in Photoshop, it’ll create a mask for that layer. If you happen to have a selection while you click that, the mask will be in the shape of your selection (if that doesn’t make sense, come back to this after reading the rest below). Below, I used a mask to block out parts of that gradient, so they don’t show up (and the white from the layer below shows up underneath. 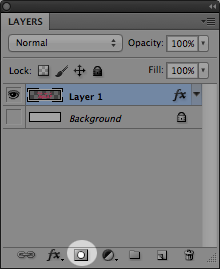 Once a layer has a mask, you just click on the mask (circled below) to draw on it. Don’t be alarmed if you see black and white only in your brush colors— black = the area you want to hide, while white = the area that’s showing. You should be able to do grays, too. 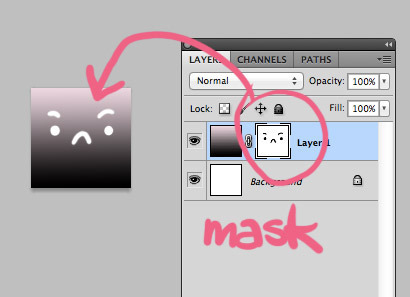 Get out of mask mode (by clicking on the the artwork again; left of what’s circled below, for example) and you’re back in a normal drawing mode. 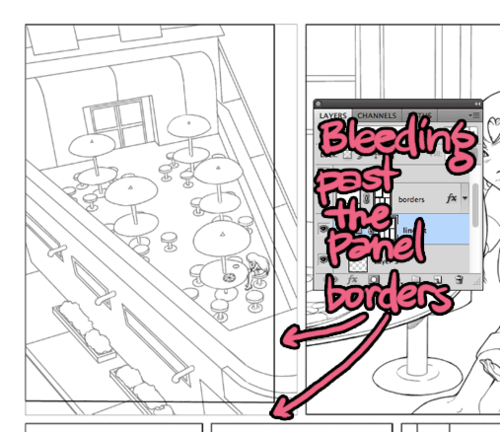 Okay, but why wouldn’t I just draw straight onto the layer instead? 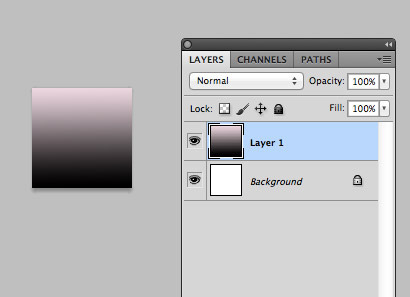 Because, when using a mask I can modify that drawing without really changing anything/hurting the original gradient. 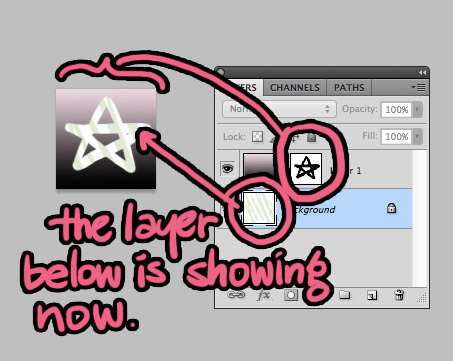 Right, but… If I wanted a star or something, why not just add a layer on top to draw it? Besides, it also allows you to put back things you’ve hidden. If the shape of that star is off, for example, or if you’d generally like to have a shape that needs to be drawn more carefully, it’s much easier to draw that shape in blacks and whites, instead of painting the gradient to fit that shape. You can remove or put back things, as much as you want, with a mask. So, if you want to make edits but don’t want to permanently change your artwork, or have to save a million duplicate layers to keep the original art, or rely on a crapload of undos, use a mask. Whatever you use them for is really up to your imagination, or something like that. Really, there are so many more things you can do with masks than what I’ve shown here. In the future, I’ll go into that. Masks are awesome.